Nancy Wright Beasley’s seven-year journey that led to this book began when she heard a Buchenwald survivor recite names of family members who died in the Holocaust. 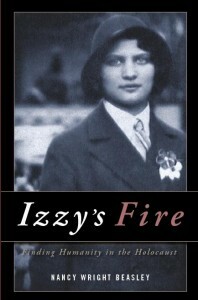 Beginning to understand the significance of recording survivor history, she read memoirs, interviewed survivors and discovered the miraculous journey that finally led Edna Ipson and her family from the heel of the Nazis to “the other side of hell.” She tells of their journey in Izzy’s Fire. “Izzy’s Fire” was named as one of five outstanding nonfiction books written by Virginia authors in 2005 and was nominated for the People’s Choice Award. The People’s Choice Awards are given for the best fiction and nonfiction books by Virginia authors published in the past year, as decided by a vote of Virginia readers. The award is sponsored by the James River Writers and the Library of Virginia. Selection is made by the public by voting online or at libraries and bookstores throughout Virginia. This was a really good book, hope every one will soon read it and see how it was so bad back then. Everyone is so lucky now in these days we don’t have discrimination as bad as they did. This book shows what happened in the Holocaust. So everyone should be grateful about what they did to stop it. I enjoyed reading the book. I know there was a lot of research that went into it. I live in Norfolk Va and had to get my library to get it from Richmond. I am sometimes sad to know I am of German decent and what horrible people they were to the Jews. Praise God for this family that survived this most horrible ordeal. We are so thrilled for you and all your accomplishments and to know you personally. I just finish reading Izzy’s firevit was the best book I read in years and when I finish I realized it was signed was signed by JayIpson himself I am willing to give this copy to a family member if so desired would love to meet Mrs.Beasley or a family member!